After serving in the Army, where he achieved the rank of Captain in the Inactive Ready Reserve, Rucker was recruited by Ford Motor Co. as a zone manager. From there, he accepted a position at KFC back when it was still part of PepsiCo. Following that, he spent more than a dozen years as a senior executive at Burger King. When the company went public, Rucker went to work with former Burger King Chairman/CEO Greg Brenneman at Quiznos, where he became executive vice president and then president of international. Rucker has no complaints about his work on the franchisor side. In fact, he says, "I loved it." But the fun really began in 2010, when the husband and father of five formed Rucker Restaurant Holdings in Phoenix. "I was just waiting for the right opportunity to become a franchisee for a real blue-chip brand," he recalls. "Working for a franchisor was an intermediate goal to gain a lot of learning, as well as to excel in a corporate environment. I enjoyed it tremendously and what it did, both directly and indirectly, was give me the opportunity to understand the true definition of a good franchisee and a good business model." Working in corporate franchise leadership, he says, enabled him to demonstrate the leadership and managerial skills he'd acquired in the military, which were directly transferable to business. "I further enhanced and balanced that with my soft skills," he adds. The University of Colorado graduate says he also worked with some of the best franchisees in the business. "There were some difficulties, but I learned from both franchisor and franchisees about the type of franchisee I'd like to be." 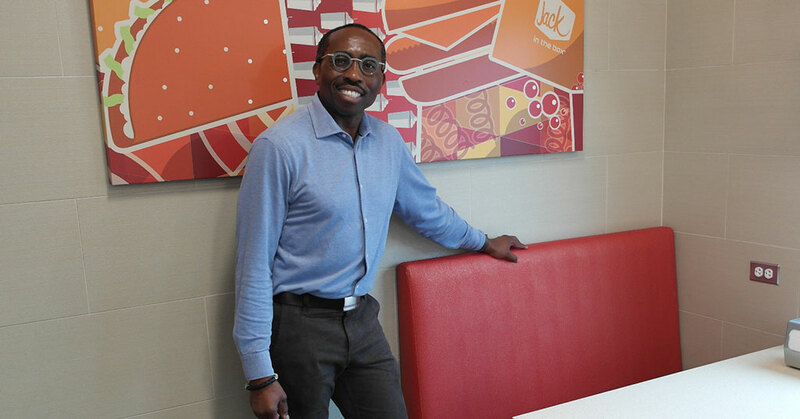 When the time came to choose his first brand as a franchisee, Rucker went with Jack in the Box. "There are a lot of brands you can go out there and work with, but there are certain brands that you aspire to be part of, brands that define who you are. If you have a certain passion for a brand, it makes you a better franchisee for it," he says. In January 2011, after a year of training, he closed on his first 10 Jack in the Box restaurants. He now has 60, in Arizona and Texas. "What I liked about Jack in the Box was the tremendous core equities, the menu variety, the franchisee-franchisor relationship, and the tenure of the leadership team and franchisees. It is a complex thing, being a 24-hour brand and serving every menu item 24 hours. That's hard to replicate," he says. "I'd eaten there for years (my favorite is the Sourdough Jack) and the food quality is phenomenal. I see it as a power brand that has a tremendous amount of untapped potential even though it's over 60 years old. The brand has upside and a bright future ahead." Rucker then entered a period of hyper-growth. "You can't grow without having a great plan and great people! So we developed a core team that continues to develop. We've all been able to play off each other as we've developed our teams. Growing to 60 restaurants was a team effort. I'm the franchisee but I say 'we' because it takes a team," he says, adding that Jack in the Box also has a healthy base of franchisees with tremendous institutional knowledge that is openly shared throughout the franchise community. While considering a second brand, Rucker had his eye on another blue-chip franchise, Denny's. His opportunity came earlier this year when he acquired seven Denny's restaurants in Houston. "I wanted to choose a blue-chip brand with great legacy and dynamic consumer appeal, but also one with a promising future. And Denny's is a great franchisor that really values its franchisees. They focus on the consumer, have tremendous innovation and brand positioning, and they compete very well." Rucker says Denny's, which is in the family dining category, works well with his QSR brand Jack in the Box. "Family dining is a steady category. Consumers want to have a great place to take the family for breakfast, lunch, dinner or even late night," he says. "Having an understanding of the 24-hour business model where you sell every product every hour is the same way that Denny's works. It's just a different category and execution. The similarities between the two have also helped us develop opportunities for our teams on both sides, which means opportunities for internal career growth." Known for his energy and discipline, Rucker believes flawless execution is key to maintaining strong results--along with a robust capital structure and high standards within an organization. "As a franchisee, you need to lead with impact, grow a consistent and team-focused culture, and maintain a positive tone, especially during high-growth periods." He understands his role as a franchisee to mean operating well and developing his two brands. At this point, he plans to grow both organically and to pursue smart acquisitions--and execute operations standpoint at the level, he says, "that the franchisor expects and that you expect of yourself." Rucker attributes much of his success as a franchisee to his team and employees. He acknowledges it can be a challenge to find great people, but says it's not insurmountable. "You have to have a good culture. Because we've been in hyper-growth mode, we are continuing to work to improve on the basics of our culture. We're doing things like providing performance equity plans, which gives key people a chance to look out of the same lens as you as a franchisee," he says, adding that a key aspect of his philosophy is doing more for employees than the law requires. "What makes this all so great is that you have a team of people working together with a common view of what success is," says Rucker. Dishwasher at the Officer's Club on Lowry Air Force Base, Denver. My parents were a major influence in my life. My father is a retired U.S. Army Command Sergeant Major and my mother was a homemaker, and they modeled parenthood outstandingly. Both were extremely involved with my siblings and me on a day-to-day basis to ensure that we all stayed on track. Receiving a BA from the University of Colorado-Boulder, and an MS degree at Central Michigan University. Being an Army ROTC graduated achieving the rank of captain. I also had a 20-plus year career on the corporate side of the restaurant industry, where I ascended to executive team level. Increasing performance at all levels and striving to maintain a competitive edge at all levels. Becoming a franchisee! This was a complete transformation along with "hyper growth" (from 10 to 70 units in seven years), so we developed an infrastructure that is able to grow at the pace needed for success to continue. Becoming a Jack in the Box and Denny's franchisee! They are both "blue chip brands" that have many core equities you can continue to build on for the long term. I am in the markets where we have restaurants every day unless I am at brand-associated meetings. The week will probably make up 80 to 90 hours. But I'm having lots of fun doing it! I'm an exercise enthusiast. I run 4-plus miles every day except Saturday and Sunday and couple that with weight training. I have been able to maintain this for quite some time now. It gives me the energy needed for our business. "To stay the course." Be tenacious and never let up! Continue to drive for results with unwavering discipline. People! This is the root of our success. We have to take care of our people while also getting them to look out of the same lens. We must all have a common view of the opportunity. The good news is that I have a family that really understands this business and its demands. So even when we are vacationing, I'm never completely disconnected. I'm still having fun vacationing and able to be in touch with the business. Chocolate cake, brownies, and chocolate-chip cookies. That I love to ski! "No task is too difficult. No sacrifice is too great." I have a democratic style, but one that fosters decision processes that are streamlined. Getting to the point where our organization is truly the employer of choice in the markets where we do business. A person with high integrity who cares about people, a growth driver, open to feedback, and collaborative. I want to constantly improve at all levels/aspects of our business. As we have our leadership calls and on-site meetings, we openly share best practices and discuss ways to improve throughout the enterprise. Each of the leaders has the ability to share and own an initiative that could find its way to becoming a "blue chip" for the entire enterprise. Extremely close! Operations is the heartbeat of our business. We scorecard it and discuss it on a daily/weekly basis. Strategic foresight with focus on trends and brand stewardship. Understanding the franchise P&L, EBITDA, capex, etc. Outstanding products and service with "thought leadership" 2 to 5 years out. My marketing strategy is about executing in a differentiated way within the four walls of the restaurant. That's my controllable. It is becoming an integral part of life for my consumer base. This is the way they want to hear about what's going on in our business. We must invest in it and use it. We do our best to grow from within, seeking out the best performers and stretching them into roles where they can succeed, benefit themselves, their families, and our organization. Separately, we are a performance-driven company that focuses on results and accountability. Just shy of $100 million. To acquire additional restaurants and continue to improve the existing base through operations and remodels in both the Jack in the Box and Denny's brands. Through revenue, operating metrics, facility image, and brand relevance. I haven't set that goal. I'm focused on smart growth and developing a great team. We will see where that takes us in 5 to 10 years. It is extremely robust in the market where we have presence. This also presents a challenge when it comes to competing for the best employees. Additionally, we compete heavily for our share as it relates to QSR and family dining restaurants. Yes, the unemployment rate continues to decline and consumers are spending. But we all (restaurants) have our challenges when it comes to driving traffic to our respective restaurants. It's imperative for the franchisor to continue revisiting the brand strategy for any possible tweaks or improvements and, as a franchisee, we will improve our controllables. Best sources are cash flow, cash on balance sheet, and senior debt (leveraging conservatively). Whenever possible, always reinvest in your business; the best source for expansion is the cash on your balance sheet. You've got to deploy that in the right way. It's also smart to conservatively leverage the business while continuing to use senior debt to help you grow or remodel. I do have experience with private equity, but I think it's important to pick a good institutional partner with a great investment philosophy that works for both of you. Right now, we're working with BofA as our lender. They're a great lender! We put together retention plans for employees that will maintain continuity leadership at the restaurant level. It's important to do what you say you'll do when it comes to employees in terms of providing competitive salaries, wages, benefits, and bonus programs. Be consistent in what you're communicating as it relates to the employee programs that are going to be in place. Make goals and objectives achievable. That's a good way to develop a long-term relationship with your team. It's challenging, but I'd say it's not impossible to do. Hopefully it's not something we are doing because it has become a requirement. We want to get ahead of the requirements by doing it because it's the right thing to do for our employees. It also gives you a competitive edge, being able to have the foresight to take care of your employees. If you go beyond the requirements, you can get the best people. If you get a reputation for going beyond what the law says you must do, you have a good chance of becoming an employer of choice. That's what we want to be! Through the incentives we provide, quarterly contests, and annual contests. We like to tie some things to the holiday time frame, giving people a chance to earn extra dollars along with their regular bonus, to have additional funds for their families during the holidays. We also do ongoing things--baseball and football tickets, basketball tickets, iPads. We provide opportunities for employees to achieve certain service goals or other operating metric goals. I am actually passionate about the business and am having a blast at it. And everything I do when it comes to this business makes good commercial sense. With that said, I have no exit strategy in place. Let's keep growing!